Multicolor Gerbera Flowers For a special occasion where you want to express happy wishes, multi color gerberas are the perfect flower. They are loud in appearance, bold and extremely beautiful, and recipients of these vibrant flowers will automatically feel happy. Multi color gerbera flowers are a great flower for birthdays, to congratulate someone, to wish warm wishes. It has even been said that gerbera flowers were used to cure insanity, treat smallpox, tumors, jaundice and skin diseases in Wales during the Middle Ages – what power! Arranging Multi Color Gerberas: Dramatic yet sophisticated, the vibrant multicolor gerberas are the birth flowers for the star sign Leo (July). 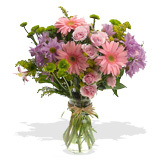 The multi color gerberas make a beautiful compliment in any flower bouquet, and are often mixed with other flowers. We ship each individual gerbera floret with a protective net and a clear tube to support the stem, to ensure that the flowers arrive and flourish to their maximum beauty and expected vase life. Your gerberas may be prone to bent neck, which can be avoided by inserting floral wire in the gerbera stem to lend additional support to the large floret. Otherwise we advise to leave the clear tube as they will only serve to provide additional much needed support to large floretted multi color gerberas you receive. Multi Color Gerbera Bouquet Care Tips: Your multi gerbera bouquet has an estimated vase life of 4-7 days, if properly take care of your gerberas can last longer. On receiving your multi colored gerbera bouquet, make sure you gently remove the protective cup from each gerber blossom; as the petals will gradually unfold to their full state. Fill your vase with approximately 5 to 6 inches of water depending on its height. Your gerberas have fuzzy stems that decompose quickly in deep water. Gerbera stems are highly susceptible to bacteria blockage which may cause their heads to droop over. Therefore it is very important to use clean water and replenish their supply of flower food every 1-2 days. To make sure gerbera stems remain straight, support the heavy flower heads when conditioning in water.